If you use the Direct Credit export tool or if your business is Invoice basis for GST, you will already manually create transactions in your database. Scan my Bills is the ideal solution for your office processes as it can speed up your data entry and ensure the accuracy of the information that is captured. Have a look at the case studies below to see how you can create transactions using Scan my Bills documents. Alex enters bills as transactions into Cashmanager RURAL at the beginning of the month and uses the Direct Credit Export function to send those bills to her bank to pay on the 20th of the month. This means she has an early view of her cashflow position for the month. Scan my Bills works well with her office system as it helps her to record in-depth information from invoices that she previously didn't have the time to include. Tom is required to enter invoices into Cashmanager RURAL as he receives them. This is because of his GST status, which means he declares the GST on items when he receives an invoice, not when the payment is processed at the bank. Scan my Bills works well for Tom as it reduces manual entry and minimises invoice information being entered incorrectly into his database. Click on the Bills button at the top of the screen or if there are bills available, the Scan my Bills box will automatically appear. Select the document you want to import into your database. Click on either Add Single-Line or Add Multi-Line. REMEMBER: If there is more than one invoice line in the document, you can select from either option. It depends on whether you want to show each line or combine them into a single line transaction. 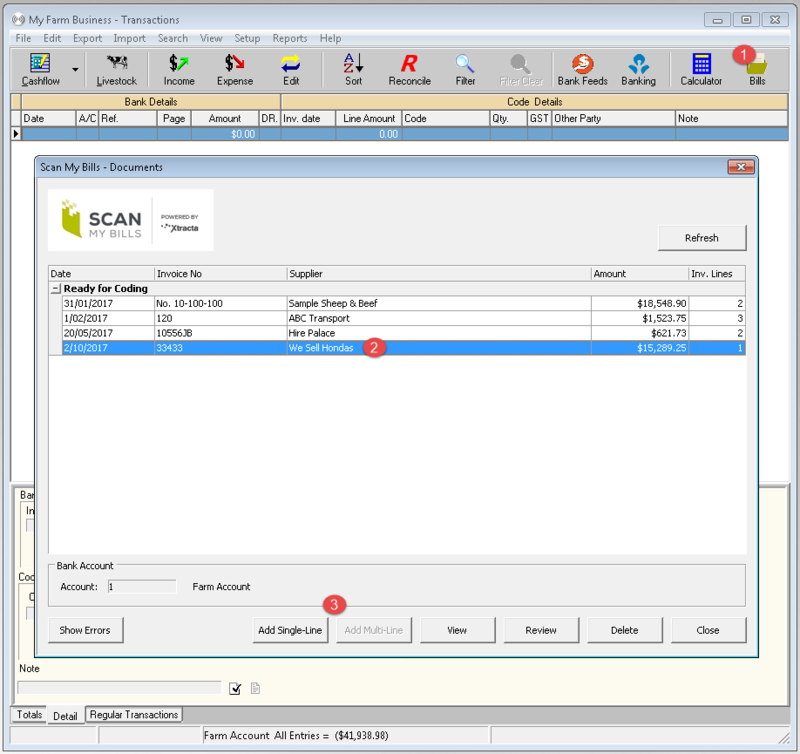 Notice the Invoice date on the document automatically appears in the transaction along with other information such as the total amount due (Amount), the invoice number (Reference), supplier (Other Party) and notes. You will need to code the transaction unless you have set up Autocoding for Scan my Bills. 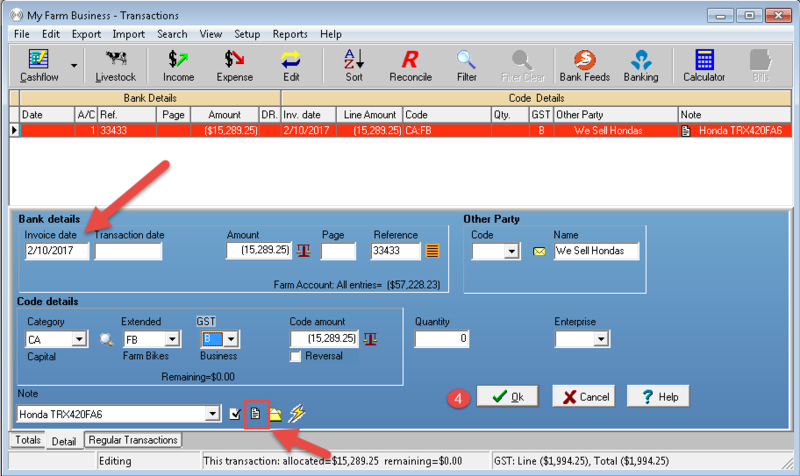 You can view the document by clicking on the notepad symbol at the bottom of the transaction.